Duthie Generator Maintenance Agreement - What does it Cover? Home / What Does a Generator Maintenance Agreement Cover? Maintenance agreements typically cover the entire generator itself for preventive maintenance. All parts of the generator, for example – the control panel where we analyze and check for invalid information. This may include tightening of a screw or an adjustment of a panel. We will also look at the radiator where we check for faulty hoses and belts. The weak points of the generator where you will see a common failure would be the batteries. That’s the biggest component that will fail if your generator is not checked often enough. When we see the generator every every 6 months on a maintenance agreement we are able to catch failed components before they’re needed in an emergency. 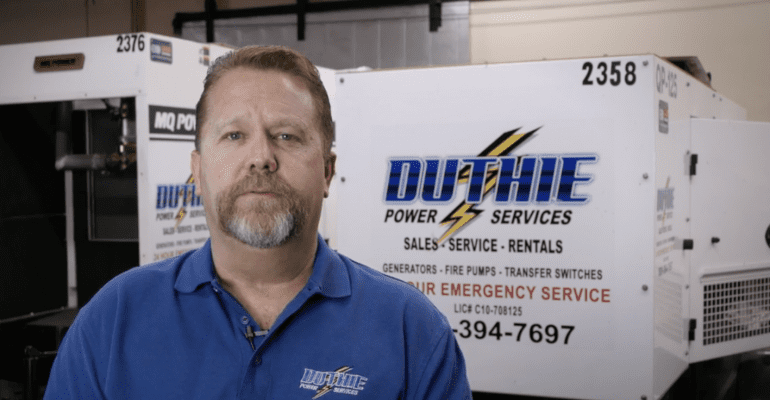 For more information about generator maintenance agreements or to request a quote, click here https://duthiepower.com/request-a-quote . Or give us a call at 1-800-899-3931 to learn more about Duthie Maintenance Agreements.